Nokia 3250 has a unique design twists to transform it from a traditional phone keypad into dedicated music keys. The Nokia 3250 stores up to 1 GB (750 songs) of high quality music and offers 10 hours of music play. In addition, users can take advantage of the Nokia 3250 2 MP camera with a smartphone capabilities. The Nokia 3250, newest music phone, grabbed the spotlight of Nokia Trends, an electronic music festival that took place in Berlin, Germany this weekend. The triband GSM 900/1800/1900 model is expected to start shipping in the first quarter 2006 with an estimated retail price of 350 EUR before subsidies or taxes. Nokia connects people to their passions - music - and as the world's largest manufacturer of mobile phones, Nokia is leading the charge to make mobile music widely accessible. The XpressMusic feature brand, also introduced today, makes it easier for consumers to identify those Nokia devices which are specifically designed to listen to music. One of the first devices to feature the XpressMusic mark is the Nokia 3250, which is going to stop music fans in their (favourite) tracks. With its unique twist design makes it quick and easy to switch between the music keys, the regular keypad and the camera mode. By twisting the keypad of Nokia 3250 180 degrees, user can change mode between the music mode and the normal phone keypad. The music player of the Nokia 3250 supports a wide array of digital music formats such as MP3, AAC, WMA, M4A. Additionally, songs can be downloaded over-the-air while on the go and favourite songs can be set as ringtones. Also, you can use USB cable to download music while internet online. The Nokia 3250 supports microSD memory cards of up to 1 GB with storage capacity for up to 750 songs. An FM radio with Visual Radio client complements the Nokia 3250's complete music package. Using the Nokia Audio Manager software, users can convert their favourite CDs into digital music files, and "drag and drop" their personal music collections and favorite playlists directly from their computer. Headphones can be connected to the Nokia 3250 via the 3.5mm connector of the Nokia Stereo Headset-HS-20, making the list of available enhancements even longer. The Nokia 3250 comes with a 2 megapixels camera, which is activated in the camera mode by twisting the Nokia 3250's phone's keypad 90 degrees. The images that has you snap, can be instantly shared with others via MMS, or printed on a compatible printer via Bluetooth wireless technology. Plus, you can share your favourite moment by mobile blogging and send your snapped pictures. 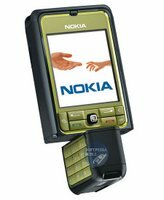 Nokia 3250 is based on the third edition of Series 60 platform and Symbian OS, offering a broad set of features and messaging functionalities and enabling third-party application developers to create their own music applications. Those applications can be downloaded and installed on the Nokia 3250.